Our product range includes a wide range of aspherical lens, gonioscoper 3 mirror, diagnostic ophthalmic strips, capsules hook and irish hook. 4 mirrors angled at 62 deg help in viewing all quadrants of the anterior chamber without rotation. 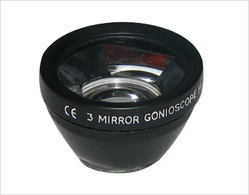 The small contact surface of 9 mm diameter makes the lens very convenient to use. 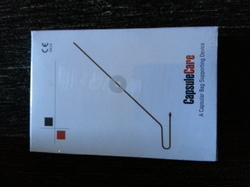 - Detachable Handle (can be fixed straight or at an angle). - Useful for both diagnostic and dynamic Gonioscope. This diagnostic strip made from the Whatman No 41 filter paper measures the amount of tear production. These strips are individually wrapped and are gauged so they can be easily read. The Schirmer test is based upon mechanical reflex stimulation of the tear production and is actually a test of reflex tear production when performed without anesthesia. Place a dry Schirmer strip over the middle to lateral 1/3 of the lower eyelid. The patient is then instructed to look forward and blink normally. The strip is removed after 5 minutes and amount of wetting is recorded in millimeters. Box of 100 individually packed sterile strips. These strips work by staining the cornea blue upon instillation. This causes "speckling" of the cornea, which gives the doctor immediate indication of any dry patches, as well as any muco-deficient or damaged corneal cells. Most importantly, it does not sting the eye like Rose Bengal, and a white light or blue light can be used on the slit lamp during detection. Available as sterile strips in individual pouches. Rose Bengal is an ocular stain that has affinity for degenerating epithelium (outer layer of cornea). It stains devitalized or degenerated epithelial cells as well as mucous filaments. 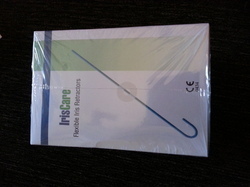 Available as sterile strips in individual pouches.